OK, now the royal wedding is over we can start to build up to that other global event that takes over our lives - yes, the FIFA World Cup. And whilst most of the stories we will read about will be concerned with sporting prowess or fan behaviour, this ad focuses on the historical impact of this global sporting event. The BBC has decided to use a very different art form to tell the story about the tournament taking place next month in Russia. It has created a 600-frame tapestry that depicts moments we all remember from past world cups - Gascoigne's tears in Rome, the head-butting by Zidane. But by using an old technique for story telling (although created in a very modern way), the tapestry commercial also brings to life Russian heritage and passion. And it is beautifully accompanied by a Russian folk song adding a richness to the advertisement. 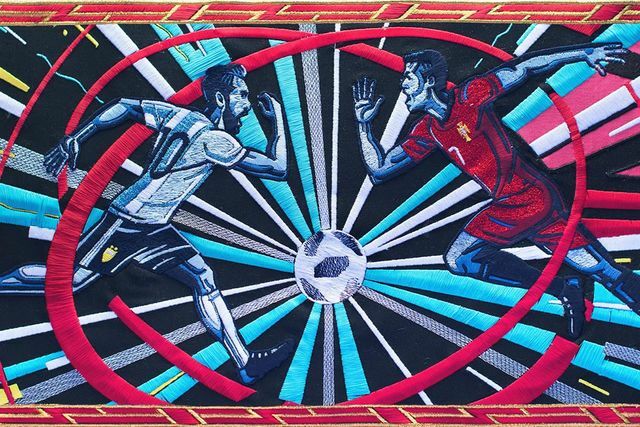 The BBC has also looked to the future and social engagement during the competition by planning to add to the tapestry, with fans' favourite moments being captured after the tournament. I think it is the juxtaposition that makes it so striking - we associate tapestry with fineness, richness and a feminine craft and yet tapestries tell stories about battles won! Hopefully this final tapestry frame will be about England winning - oh well, we can but hope!